The National Citizens Alliance (NCA) condemns Islamic radicalism and any other radicalism, and in particular the immoral treatment and harm inflicted on all civilians including women, children, and men. The NCA’s fundamental and primary focus as a government is the safety and well-being of the Canadian people. We are in service of the Canadian people. The federal government has taken a weak approach to dealing with Canadian ISIS fighters who chose to fight against our country and troops, and participate in a malignant ideology including monstrous acts. The NCA rejects the federal government’s use of Canadian tax dollars to attempt rehabilitation of these terrorists. In addition, we condemn Prime Minister Trudeau and the federal government for putting the Canadian people in a high risk situation by allowing these terrorists into our communities. 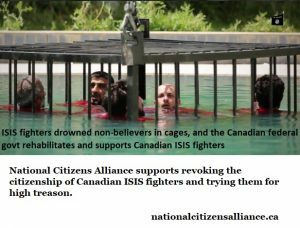 The National Citizens Alliance supports trying them for high treason under Section 47 of the Criminal Code. In addition, we support capital punishment for individuals who act out the most egregious crimes including terrorism. However, the NCA will only reinstitute capital punishment if the majority of the Canadian people want it reinstituted. The NCA membership vote on 2014-11-07/09. The vote resulted in 100 percent of membership in favour of the ISIS Fighters Policy Statement with a 100 percent quorum. This vote outcome satisfies the minimum 70 percent membership support and 50 percent quorum required for adoption of policies as per the NCA Constitution (2014).